Fits 26"-47" screens up to 25kg/55 lbs. Fits all VESA patterns from 200x200mm to 400x400mm. Ideal space saver - folds 56mm/2.2" from wall. Max. 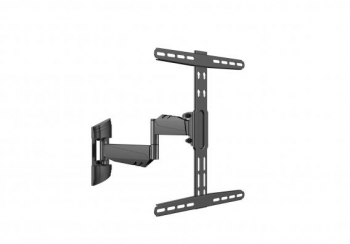 421mm/16.6" arm extension allows mounting near corners with most screens. Tilt angle -12 to +2 degrees. Screen level adjustment after installation + or - 3 degrees. May also be used for Hospitality Industry TVs with connections at center rear of screen.